Cats are not our whole life... they just make our lives whole! In my experience, kittens can play rough, but this goes to an extreme. First of all, I would confine this little guy in a room by himself. I would not subject the other cat to this behavior because I can only see it escalating. I know that when momma cat has a litter she teaches "good kitty manners" to her babies and it sounds like this guy didn't have the benefit of that. I don't think I would handle him right now. Does he get play time with toys to wear him out? Is this aggression or simply rough play? I think I'd be talking to a behaviorist about this guy if you're serious about changing this behavior. Is it possible he has a neurological or other medical issue? Something clearly needs to be done. With TeenyCat (similar story), I took her to the vet to make sure nothing was wrong. The bottle fed babies seem to have more behavior problems then usual I guess because there's no Mommy cat to lay down the law. The vet told me to carry Teeny by the scruff the way Mommy would and tell her no (sternly) and put her in the carrier for awhile. She did learn what no means. My other cats bopped her for awhile the way Mommy's and siblings would. She also needed a real rough play time with feathers on a stick. She was at that learning to hunt age, and needed to learn not to mess with the people. It takes time, but it does blow over. Teeny was a perfect sweetheart again by 8-9 weeks old. Just keep yourself safe, teach him what no means, and don't let the other cat do too much damage. Palbuddy-I had the same problem with a stray my sons girlfriend found. About 2 1/2-3 weeks. This is when they play rough with siblings & the mother tells them when it is too much. Definitely pick her up by the scruff & when you tell her no;give her a little smack. If your older cat will teach her thats great. If not,you must be Mommy cat. Try yarn chases & feather toy play. If she doesn't play nicer after strenuous exercise,tell her no & crate her for about 1/2 hour.Don't yell at the other cats & or dogs if they are a little rough with her ,as long as they don't hurt her.They may step in & teach her to be gentler. Just to let you know, TeenyCat is now four years old and is a cuddle bug. She sleeps on my pillow with me. thanks for telling me that. thats what i want more than anything!!! after loosing 2 of my best friend fur babies last year, i just cant sleep without fur on my pillow. i miss them soooo much. i wasnt going to get another cat, the loss was so hard, but my nephews girlfriend found this one at 2 weeks old and begged me to help so i took one look at his face and i dissolved. i did the math and relized this kitten was born on the same day as my cat who passed, how weird is that? maybe hes come back to me. god i hope so! My husband and daughter say Teeny is too attached to me, but I think that I became the mommy cat to her. i did the math and relized this kitten was born on the same day as my cat who passed, how weird is that? maybe hes come back to me. god i hope so! I believe he has come back to you. I really believe in that. Don't forget, they have 9 lives. Maybe that is what it means. We think our 20-year-old cat who passed 6 years ago passed the torch to our 6-1/2-year-old. 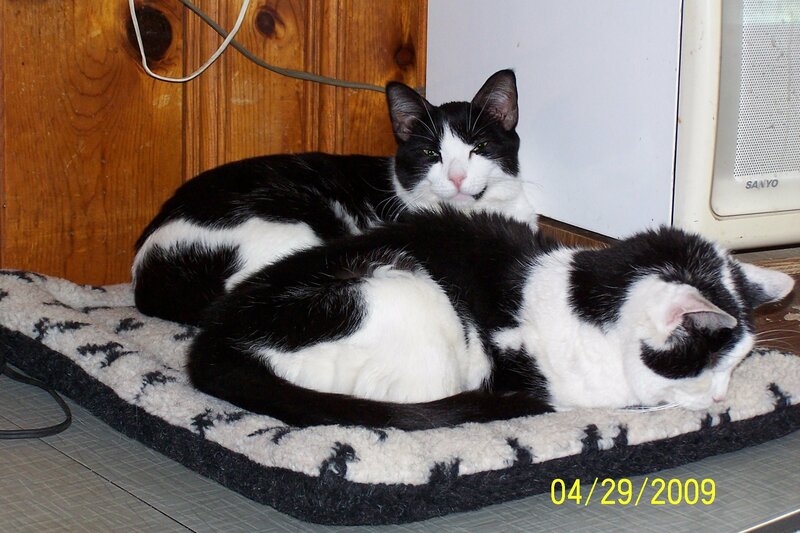 The younger one had only been here a few months when the older one went to Rainbow's Bridge. She took over as head of the house. Your kitten will be okay. Years ago we had a little 2 to 4-month-old who used to run up the drapes 6 feet, scoot across the drape rod another 10 feet, and down the other side. My husband kept saying, this cat must have something wrong with him. He must be mental. Nahhh, he was just a kitten. Lived to be 17. Sometimes it helps to adopt 2 kittens simultaneously so they can roughhouse with each other. Those kitten claws are the worst for drawing blood. Ouch. Make sure you wash any cuts thoroughly with soap and water, dab with rubbing alcohol or antibiotic ointment. thanks just me, i really want to believe that too. it makes me feel better thinking that my old friend is safe and warm again in my house. i do have another kitten, well she is a little over a year, after my second one died i really thought i was going to have a nervous breakdown, someone sent me a site for homeless cats up for adoption, i was just scrolling thru the photos and there he was, my buddy, or so i thought. the exact spitting image of him, only a girl, and a 10 hour round trip away. rather than see me cry so much, my wonderful husband took me to get her, she is sooo much like him it scares me. im not sure, but it all feels right. maybe i do have my family back. oh, thanks for the story about the curtains, ill be taking mine down tomorrow, ha ha. Kittens are crazy, that's just how they are. Your baby didn't have his momma for long enough, so now that's your job. All the suggestions about holding him by the scruff and teaching him the meaning of "no" are good ones. It sounds like your older cat is "helping" in that department, and that's OK as long as nobody's getting hurt. If the older cat can't hold her own against him, you may need to separate them for a while - but it sounds like she's doing alright. Also, remember that he's driven to play, and this is the time in his life when he's learning how. So don't let him play rough with human skin, even if you're wearing gloves. If he starts mangling your hands, pick him up by the scruff, tell him "no" calmly and quietly and then ignore him completely for 10 minutes or so. Once he settles down, give him a toy to tear at. It sounds like normal kitten play to me. But if you ever get the sense that he's not just playing but actually being aggressive or antisocial, you may want to talk to your vet to make sure nothing's wrong. Glad that so many people were helpful. I do have a problem with giving a kitten (or any animal "a little smack" though). I think that teaches them to be fearful of humans. The scruffing and isolation is a good idea because that's what mom would do, too. The other thing is to praise him when he's being calm and playing nice. That way he will associate calm and nice with good things happening. thanks everyone, you are all sooo smart!! i took the baby out of his kitty condo to play,( without the older cat) he was much calmer. i did the scruff thing and i think he loved it. he got real calm and started purring and actually licked me on the lips. ok, i started to cry, then we played. when he bit i did the scruff thing and said no no. i swear he understands me. he ran at my ankles i said no no and he ran away.it happened a few times so maybe , this is going to work. i will keep it up and let you know how its going. thank you to all the wonderful pet lovers out there willing to spend your time answering all these crazy posts. i read them all and you have helped so much in so many ways, its the favorite part of my day!! Catmom5- The idea behind the little smack is to act like the mother cat. If the kittens get to rough they swat them. Don't know if it works or not. When we had the kitten my big male cat took over the mothering duties. It was recommended to me by a behavorist at U.Penn vet hospital.Personally I don't like hitting animals or kids.He did say do it when you hold them by the scruff.I guess that makes them associate it with the behavior instead of that you are doing it. I've used a tap on top of the nose along with the "no" and scruffing. Doesn't hurt, but it'll make them blink. Apparently it means "bad cat" in catspeak.